A slight redesign of the "Stray" cover to make the title more readable in thumbnail. On the "thumbnail readability v fancy fonts" question, I tend to go for designing the text for the print edition rather than the tiny thumbnail, but for "Stray" I think that the colour and font choice is an improvement in both the small and large versions. 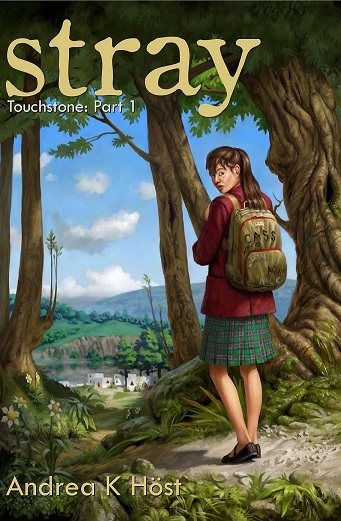 I've ordered the third cover for what is now the Touchstone trilogy, and have amused myself adding some symbology. In the first cover Cass is walking forward, but looking backward. She spends all of the first volume wanting to go home while being forced onward, and this first image shows that neatly. The second cover is "post-acceptance". Cass knows that she is not necessarily going to find any happiness staying where she is, but she is no longer straining to go home, and so her gaze is neither forward or backward, but at herself. The third cover, Cass will be facing away, inward and onward. Just with a rather...formidible barrier between her and that future. Ah, won't see that cover for a couple of months, but I'm already thinking through layout and design. I LOVE being able to specify the covers of my books.